Looks great, what are the specs? Design deadlines don’t wait…even for the best ideas. And when deadlines approach you need technical data and design specifications readily available for quick, informed decisions. The Technical Support Team at FreeAxez provides the information you need when you need it – so you can focus on finding inspiration, not spec sheets. Gridd's whole building adaptive cabling and power distribution systems deliver a Strategic Accommodation of Change. Which means you benefit from the ease and speed we adapt to changes during design…construction…even life of the building. Field problem? No problem! We have accessories and proven approaches that solve field challenges. If you don’t see it here, call FreeAxez's Technical Support Team. We are designers, innovators and problem solvers. Best of all, we speak your language! How does the flooring system interface with systems furniture? 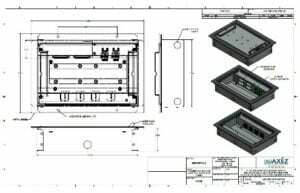 Install junction boxes within the Gridd System to mate to systems furniture pigtail connections. Power and data cables exit the Gridd channels through grommets and connect to a junction box or base feed connected to the furniture. With GriddPower, power whips connect at 1’ intervals along the 3 phase 50 amp power bus and terminate at under desk power strips mounted under the desk. How do you accommodate high cable density areas in the system? We use an important accessory called the outlet cover. It provides an open cavity (or manifold) to accommodate high density interface areas at telecom rooms and electrical rooms for greater flexibility in distributing cabling to the channels. Accommodating these cable ‘choke points’ is the main reason for the outlet cover. 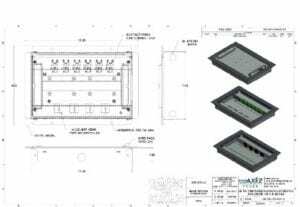 It also accommodates junction boxes and zone distribution boxes anywhere in the space and installs over core holes to let cabling enter the system from below. 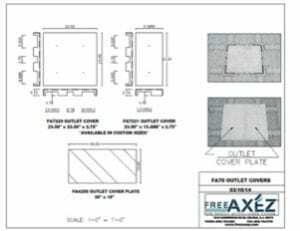 Raised access flooring outlet cover & Raised access flooring floor plan. How do you transition cabling from within the wall into the FreeAxez system? These photos show a few approaches to transition from behind the wall into the FreeAxez system. Conduit within the wall can be bent with a sweep to do the same thing. How do you transition cabling from adjacent IT and electrical rooms into the system? See photos showing cable transitions through blocking and under a sheetrock wall. What are the options for floor boxes? FreeAxez offers a variety of floor boxes for both the Gridd-40 1.6” and Gridd-70 2.75” systems. Our standard boxes are listed below. Custom device plates, enclosures and lids are provided upon request. Both of these models are flush solutions with floor covering inlay for a clean, aesthetic look. They typically have 4 NEMA power outlets on the high-voltage side and various options for low voltage connections on the other side (RJ-45, Ethercon, MAAP, XLR etc.). Note: Custom device plates are available. Just let us know your configuration requirements. We’ll prepare the cut-out in the base unit so the electrician can install the box without any field cutting. A floor box can be placed at any base unit location. What kind of electrical cable is installed in the system? All wiring/cabling installed under the floor(s) must conform to the applicable sections of the National Electrical Code (NEC) in effect. So you can’t run open conductors within the system. The installer must conform to NEC wiring like MC cable, EMT, or appropriate communication system wiring methods. The Gridd system does not require grounding. See the attached Grounding & Bonding Summary for more information. What is the load performance of the flooring system? Do you build walls on top of the flooring system, or build the walls first, then install the flooring system? It can be done either way. However, FreeAxez recommends that you build and finish ceilings and walls first to minimize construction traffic and debris. The Gridd flexible border components install easily around interior walls and columns. The Gridd specification lists the level requirement as FF=25, FL=20, which is roughly equivalent to +/- 3/8” in 10 ft. We’ve also included a description of the FF and FL level definitions. Note in the table that the slab requirement for FF25/FL20 is Moderately Flat. Gridd installs on top of common slab conditions, often without additional floor preparation. It’s actually more accommodating to unevenness than carpet alone. Each base unit has 36 legs. The foam under sheet separates the legs from the slab and minimizes bumps and dips in the concrete. Pivot points are easily eliminated by adjusting the leg(s). Gridd accommodates seams, patch areas and junction boxes in the concrete, etc. In the event of a larger dip or rise in the slab—for example a 20 ft. puddling area—then some floor preparation is necessary.